He says the government shouldn’t regulate pollution, shouldn’t meddle in healthcare, and shouldn’t tell people they can’t own slaves. Lovely. They call him “Minnesota’s mini-Trump”: Jason Lewis, the right-wing talk-show host who’s running for Congress for an open Republican seat in the suburbs south of the Twin Cities, the 2nd Congressional District. It’s the same seat Bill Maher targeted two years ago in his “Flip-a-district” campaign—only then it was held by a six-term Republican incumbent named John Kline. Maher’s effort didn’t work; Kline was reelected. 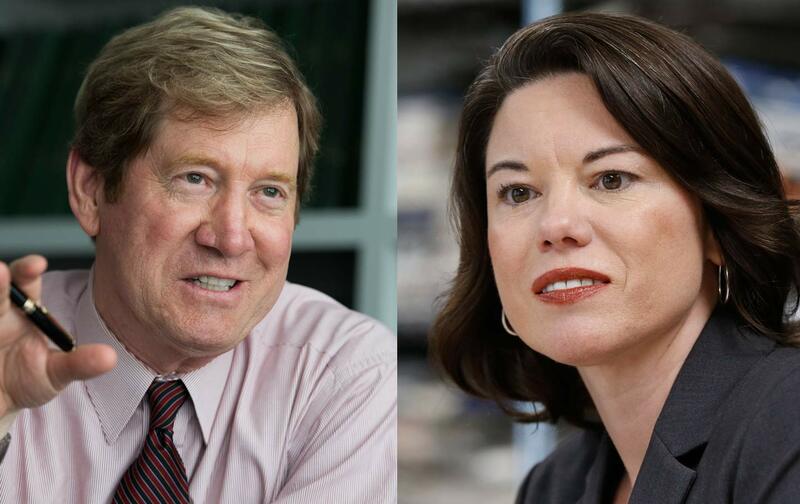 But in April 2015, Democrat Angie Craig announced that she would challenge him in the next election—she’s a heath-care executive who had never run for office, and a lesbian mother of four—and then in September 2015 Kline said he wasn’t running again. Obama had carried the district in 2008 and 2012 and Senators Al Franken and Amy Klobuchar had both won there—Franken narrowly, Klobuchar easily—making it one of the few genuine swing districts in the country. That’s why the Democrats are making a major effort to flip it this time around. Jason Lewis is the Republicans’ gift to the DFL (the “Democratic-Farmer-Labor Party,” as the Democrats call themselves in Minnesota). Two decades of ranting on the radio (he quit in 2014) have provided a gold mine of Trumpish material for his opponent. He’s complained about white race “suicide,” pointing out that Latinos have a higher birth rate; he’s complained about single women, who, he says, “vote on the issue of somebody else buying their diaphragm” (i.e., including reproductive health coverage as part of Obamacare). He’s what you might call a crazy libertarian: “if you don’t want to own a slave, don’t,” he said. “But don’t tell other people they can’t” (i.e., the government shouldn’t tell people what to do with their lives). There’s lots more like that—and voters in the district are now learning all about it. Environmental issues are big in Minnesota, and one of the biggest polluters in the state is located in the district: the Pine Bend refinery, south of St. Paul, owned by the Koch brothers. Their Minnesota refinery prospers because the Keystone XL pipeline is not being built—so bitumen from the tar sands in Alberta goes by pipeline to the Twin Cities suburbs instead of to refineries in Texas. The refined products at Pine Bend include petcoke. A Rolling Stone investigative report described petcoke as “Denser, dirtier and cheaper than coal…the dregs of tar-sands refining.” Petcoke is mostly banned in the United States, but the Koch brothers ship it to Mexico and China. The refinery became notorious in the 1990s for toxic pollution, especially of the water. Flint Hills Resources, the Koch brothers’ company that runs the refinery, paid millions of dollars in environmental fines in the 1990s and 2000s. At the same time it launched a major greenwashing effort, which continues today: help for Minnesota ducks, support for Minnesota Public Radio, funding a children’s theater festival in St. Paul. An example of the Koch spin: As part of a 2013 plan to expand the refinery, the company announced that it had signed an agreement with two environmental groups to “cut greenhouse gas emissions at the refinery by about 52,000 metric tons per year.” Cutting emissions—what could be better? Except that the “cut” is “about a fifth of the total expected increase from the project.” That means the net increase in greenhouse-gas emissions will be 260,000 metric tons—into the air south of the Twin Cities—every year. Meanwhile, as Jane Mayer of The New Yorker reported in her book on Charles and David Koch, their refinery in Minnesota settled charges resulting from violations of the Clean Water Act and paid fines totaling $15 million for “dumping a million gallons of ammonia-contaminated wastewater onto the ground, along with negligently spilling some 600,000 gallons of fuel into a protected natural wetland and the nearby Mississippi River.” But it didn’t end there; according to Environment Minnesota, in 2012 the refinery “dumped 739,982 pounds of toxic chemicals into the watershed of the Rush and Vermillion Rivers,” which flow into the Mississippi, in the 2nd Congressional District. The political issue here—in Minnesota and nationally—is the Republicans’ effort to block the EPA’s Clean Water Rule. A Supreme Court decision in 2006 left half of the nation’s streams and 20 million acres of wetlands without the protection of the Clean Water Act. Environmental groups petitioned the Obama administration to use EPA rule-making authority to rectify the damage. In 2014 Obama proposed what has become known as the Clean Water Rule, restoring the act’s protection to half the nation’s streams and rivers. Polluting industries represented in Congress by the Republicans set out to block the rule, arguing that the EPA had exceeded its authority. Minnesota environmental groups held a big town-hall meeting in St. Paul in the spring of 2015, and more than 200 people showed up, according to John Rumpler, senior attorney with Environment America, who was there. Before the meeting, Senator Klobuchar had voted with Republicans to overturn the rule, but after the meeting she reversed her position and voted with Democrats. The rule became effective in August 2015—but enforcement was blocked, because on the following day polluters filed suit in federal court and won stays of enforcement pending litigation. The US Court of Appeals for the Sixth Circuit in Cincinnati will hear arguments on whether the EPA exceeded its authority, with briefs due this fall. The caucus results from Super Tuesday last March have some ominous implications for Jason Lewis. More people took part in the Democratic caucuses in the district than in the Republican ones—20,000 to 16,000. In the district’s Republican caucuses, Donald Trump came in third; Marco Rubio was the winner (he also carried the statewide GOP vote). Maybe that’s why Lewis has said only that he is supporting “the top of the [Republican] ticket” without mentioning Trump by name. As the St. Paul Pioneer Press pointed out, “That’s a step back from last October, when at a debate Lewis declared that he’s ‘not afraid of Donald Trump as some of my friends in the establishment are.’” And in the Republican primary in August, Lewis did not get the endorsement of the seven-term GOP incumbent who was retiring—John Kline endorsed a more moderate candidate, and has not endorsed Lewis in his contest with Craig. Another name is missing from the roster of Lewis supporters: the Koch Industries PAC. They are focusing their money this year on Senate and House races rather than on Trump, and, as usual, have donated tens of thousands to Minnesota GOP congressional candidates. But, surprisingly, they have not given anything to Jason Lewis—although they did give this year to the Republican who isn’t running for reelection in the district. Meanwhile, Angie Craig has raised $2.5 million while the mini-Trump has raised only $370,000. The first polls show that both candidates are fairly unknown. Each candidate has released one poll. In both, slightly more than half of likely voters have heard of Lewis, and slightly less than half have heard of Craig. Lewis is somewhat better known apparently because of his radio show and because the GOP primary, unlike the DFL one, was contested and thus made the news. Many who had heard of the two candidates told they pollsters they didn’t know enough to have an opinion. That’s not surprising; usually, most voters don’t pay attention to politics until after Labor Day. In this crazy season, however, the voters in the district do know what they think about the presidential candidates: According to Craig’s polling, 42 percent support Clinton and 35 support Trump, with Gary Johnson at 13 and Jill Stein at 5. (Lewis didn’t release figures on Clinton and Trump from his poll.) The nonpartisan Cook Political Report and nonpartisan analyst Stuart Rothenberg both rate the district as likely to “lean Democratic” this November.